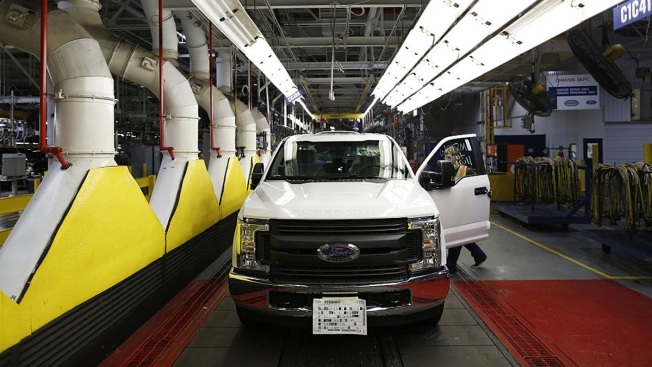 In this file photo, a Ford Motor Co. Super Duty Truck moves along the assembly line at the Ford Kentucky Truck Plant in Louisville, Kentucky, U.S., on Friday, Sept. 30, 2016. The Dearborn, Michigan, automaker said Friday that the investment in the Livonia Transmission Plant is expected to create or keep 800 jobs. Some jobs are expected to be added this year, but most will be filled over the next two years. Upgrades to the Livonia facility are part of more than $2.25 billion in investments in the state announced this year by Ford Motor Co.
Ford says the advanced transmissions provide better fuel efficiency and performance.